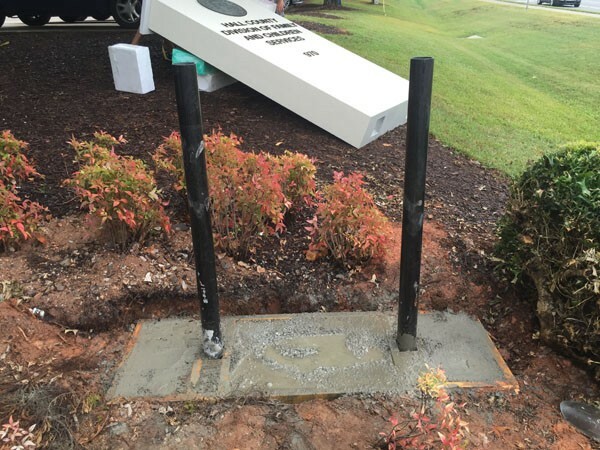 Want to know how to install a sign monument with a concrete footer? 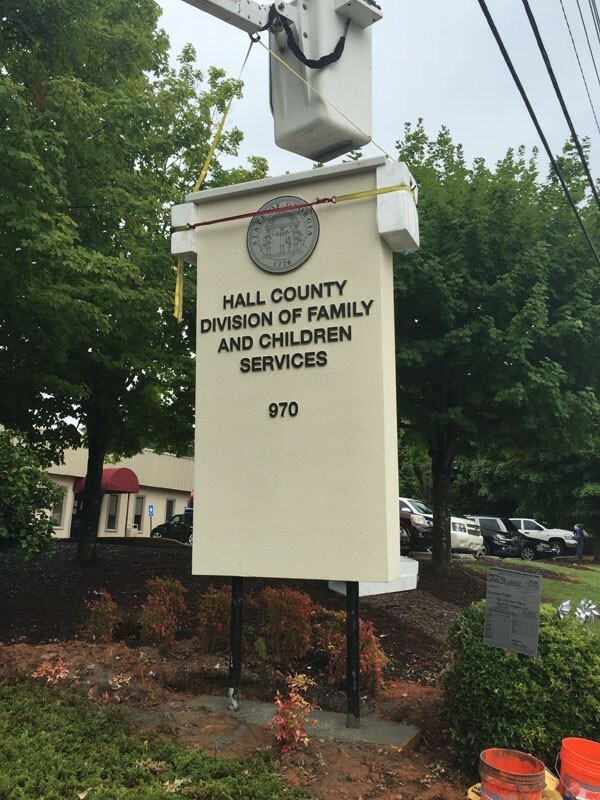 While we proudly advertise that our custom sign monument solutions do not require a concrete footer (they are designed and produced to rest directly on the ground), we do run into situations where a concrete footer (or concrete slab) is required by local Code. Our installation kits include schedule 40 steel pipes, which go below grade in all installation applications, the rest post length goes up into the monument itself. As you can see in this example, a simple wood form was created, the pipes positioned, then QuikRete Concrete mixed and poured in place. The next step is to lift the sign monument and slide it down the step pipes. We decide our wooden form to accept the sign monument while the concrete was still wet (ask our experts). Due to the height of this particular project, we used a lift to get the monument up in the air with ease. Here are pictures of the project throughout the installation process. 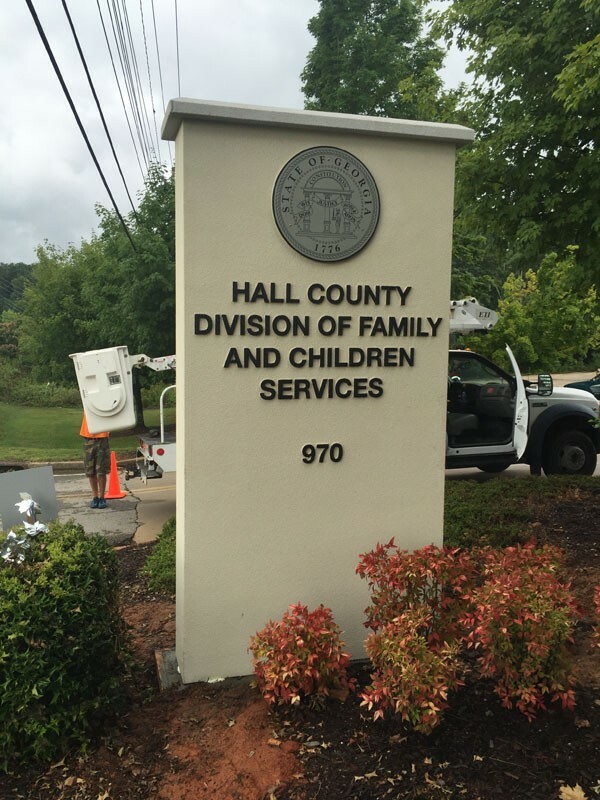 We will design your custom sign monument with optional lighting (including electronic LED message boards) to your needs, then manufacturer your project in our facilities in Atlanta, GA. Once complete, we will send you detailed photography (and a night time view if it’s have integrated lighting). Once you approve, we crate and ship your business sign to your location. The unit will arrive fully assembled, ready to position in place. This entry was posted in City Municipality Signs, Completed Sign Projects, Monument Signs by BSM Staff. Bookmark the permalink.